Julia Richardson BSc (Hons) Complementary Therapy. Julia founded, owns and runs Harborne Complementary Health Clinic (HC²). She has been practising aromatherapy since 1994. In 2001 she graduated with a first class honours degree in complementary therapy – aromatherapy from the University of Wolverhampton. 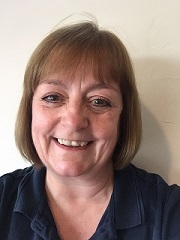 Julia is a qualified children’s nurse with 25 years experience in the NHS, the last 20 of which were spent in a variety of clinical, teaching and managerial roles at Birmingham Children’s Hospital NHS Trust. After years of planning, in March 2005, Julia elected to leave substantive employment in the NHS to start the clinic and go full-time into complementary therapies. At HC² Julia practices aromatherapy, specialising in antenatal massage and as a qualified Birthlight™ teacher, holds baby yoga and toddler yoga classes for parents and babies. A trained baby massage teacher with a certificate in baby massage instruction accredited by Manchester Metropolitan University (at academic level 2), Julia is also happy to teach parents massage skills they can enjoy practising with older children as well as babies. Julia also teaches therapists and health professionals - an IFPA accredited diploma in clinical aromatherapy, plus a baby massage diploma and CPD courses. She is a registered principal tutor and external examiner with the IFPA. She has also undertaken training using tuning forks as a form of sound therapy. Julia believes in using complementary therapies alongside conventional healthcare to maintain good health, reduce stress, provide support and aid symptom control in times of illness. Julia has and continues to be an invited speaker on complementary therapies at a number of different conferences and events and publish articles about different aspects of complementary therapy for a variety of resources including academic journals and books.